Holy Megavirus, Batman, it’s Pandoravirus! It’s happened again – the scientific community nerdy virus guys have been surprised by viruses once more! Viruses are known for being tiny balls of protein housing a limited number of genes. Influenza gets by with up to 14 genes, while the AIDS-causing virus, HIV, wreaks havoc using only 9 genes. Besides having limited genomes, viruses are usually so small that they can’t be seen with a normal light microscope. About 10 years ago these ideas were challenged by the discovery of a virus that was as big as a bacterium. The enormous mimi- and mamaviruses (technical name Acanthamoeba polyphaga mimivirus; APMV) were discovered inside the single-celled animals, amoebae, and were mistakenly identified as bacteria. In addition to their large physical size, APMV strains are predicted to encode 911 genes. The size and complexity of the genome challenged many earlier beliefs about viruses. And now, look out Mimi, because a new giant virus is in town. In July of this year, scientists reported the discovery of even larger viruses. 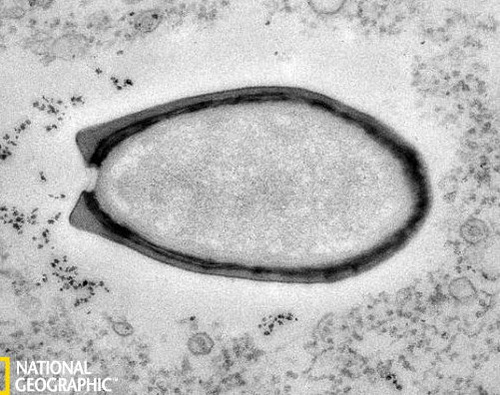 Found off the coast of Chile and in a freshwater pond in Australia, amoebae have coughed up a new megavirus. The Pandoravirus (so named for its shape and the surprises that the virus might have in store) is almost double the size of Mimi and 1,000 times bigger than the influenza virus. In addition, the Pandoravirus encodes a whopping 2,556 genes! What’s more, Pandoravirus is yielding many surprises and challenging the definition of a virus. Only ~7% of the genes encoded by Pandoravirus have been seen before, meaning the function of roughly 2,377 genes remains to be discovered. Because of its lack of similarity to other known organisms, some scientists have suggested that the viruses evolved from a distinct (now extinct) lineage. Further, Pandora’s large size makes it necessary to redefine viruses. Historically, viruses were known as filterable agents to discriminate them from bacteria, which would be caught up in a filter. Pandora certainly would not pass the filter test. It also looks more like a blob rather than a typical highly structured viral particle. The good news (besides the fact that there is a cool new virus to study) is that there are no indications that Pandoravirus can infect humans. I would be scared to think what a virus could do with that many genes!